DETAILS Usually I'm not enthusiastic about template things. Where is the creativity when you can cut it out? However, I accept that cutting and pasting are all valuable skills as well as the manual dexterity that develops in the process. 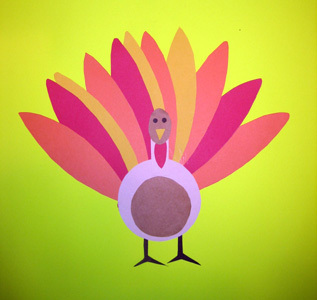 So happily here is our "cut and paste turkey" for a Thanksgiving project. You could write your "thankfuls" on the feathers if you like, or enlarge all the parts and use the finished turkey as a placemat, or put him under magnets on the refrigerator. Please don't put him in the oven!